We are enjoying beautiful, spring-like weather here is Big Bear, and while that means Mother Nature is still being stingy with the snow this season, it also means that you can enjoy our beautiful mountains in many different ways! The ski and tubing resorts are making snow every chance they get, so you can still come on up and enjoy the white stuff! You can also take a hike, go on a mountain bike ride, walk or bike around the lake, go bald eagle watching, take a stroll though the Village, and so much more!! We have added a couple of great specials to our website so whether you are coming up for a quick last-minute getaway or want to plan a long weekend, we’ve got you covered. Head over to RSVacations.net and book your Big Bear Getaway today!! They bring the full KISS Concert Experience with costumes, makeup, stage show & 40 years of ROCK & ROLL! KISS is the most successful American rock band of all time. KISSED ALIVE honors this legacy by performing material from the band’s entire catalog-from the 1st album to it’s most recent releases! Onstage, you’ll see the classic costumed characters-The Spaceman, The Demon, The Starchild & The Catman! Watch as teams from some of the ski and snowboarding biggest industry’s companies face off in a one-of-a-kind competition to determine who will take home the coveted Bear Bowl trophy and be named the masters of the mountain for 2018. Wild Wednesday: Winter Specials on Big Bear Cabins! If you are looking for last-minute accommodations in Big Bear this weekend, or if you are looking for a longer stay, you have come to the right place! RS Vacations has some Hot Winter Specials happening right now so head over to RSVacations.net to book a cute and comfy cabin for your winter getaway! Last Minute Winter Special: 20% off on Last-Minute Bookings! Why not head up now and enjoy the Winter beauty of Big Bear? The slopes are open! Save 20% on the rent when you book for the coming week within 5 days of arrival. The special will automatically apply, but cannot be used with any other discounts or specials. Offer good on new reservations only. NOT AVAILABLE FOR PRESIDENT’S DAY WEEKEND. Mid-Winter 3 Nights for the Price of 2! Get 1 Night FREE when you stay 3 or more nights this winter. Good on new reservations only and cannot be combined with any other offers/discounts. NOT available for President’s Day Weekend. Late-Winter 3 Nights for the Price of 2! 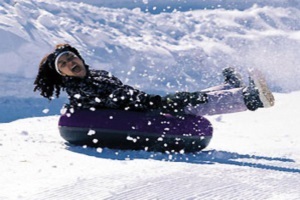 Fun-Fact Friday: Southern California’s Largest Snow Play Resort is Right Here in Big Bear! Are you looking for a great place to spend the day bonding with the kids? Big Bear Snowplay is where you want to go! Playing in the snow is one of the greatest ways to bond families together and create memories that last a lifetime. 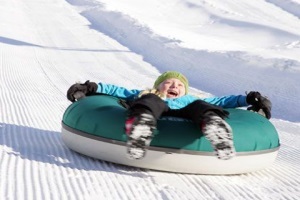 Families that seek to capture memories in the snow are in good hands because Big Bear Snow Play guarantees snow-covered hills for tubing all winter long and into spring break. Families return year after year because the Magic Carpet lifts make it very convenient to get up the hill for more downhill fun. Come on up!! Visit BigBearSnowPlay.com to start your fun-filled family getaway in the snow. Head over to RSVacations.net to pick out the perfect comfy cabin for your family. See you soon! 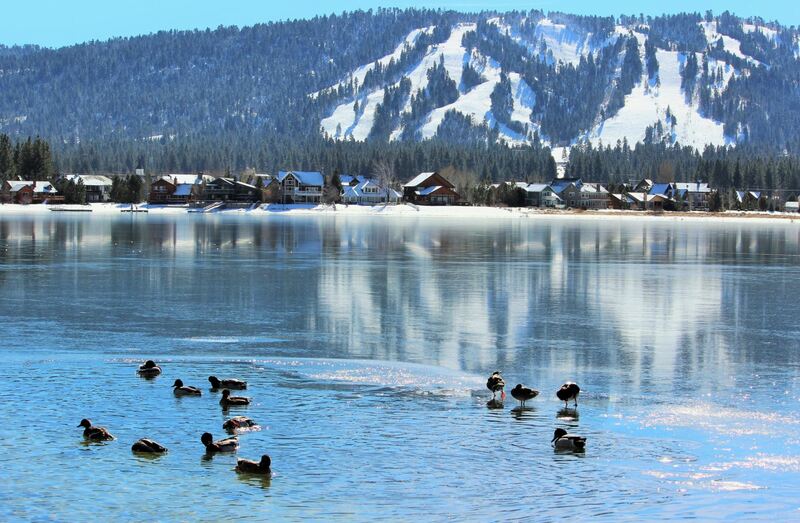 We continue our mild winter here in beautiful Big Bear Lake with daytime temps in the 50’s and lows in the 20’s. Clear blue skies and pleasant temps mean you don’t have to freeze when enjoying skiing and boarding on the slopes or tubing the snow play hills! Here in Big Bear, we have become very good at outsmarting Mother Nature! Our ski and tubing resorts make snow every chance they get so even when Ms. Nature is being difficult, our visitors still have plenty of snow to enjoy! If sliding down snow isn’t your thing, remember that we have tons more activities and events happening every weekend (and weekday!). From hiking and biking to shopping and night life, we have something that everyone will enjoy! We do have a few cabins left for this weekend and through the rest of the winter season, and pricing has been lowered to fill in dates. Head over to RSVacations.net and check out our cute and clean cabins. We provide top-notch customer service and our cozy cabins are clean and ready for your arrival! Book your Big Bear Cabin today! Descended from Rock and Roll Hall of Fame Inductees and 2016 GRAMMY Lifetime Achievement Award Recipients Jefferson Airplane. The members of Jefferson Starship past and present have been exploring the mysteries of music for more than 1000 collective years. Give or take. But who’s counting? Fun-Fact Friday: Outsmarting Mother Nature! Man-made snow is real snow (not “artificial”) made by “guns” spraying atomized water particles under high pressure into the cold dry atmosphere, which freeze into snow particles before they hit the ground. The colder and drier the air, the more water can be put through the gun. No additive or chemical is put in the water. The only difference between natural and man-made snow is that the latter falls as small round pellets due to the air turbulence, while natural usually comes in the form of small to large flakes. However, in windy conditions even natural snow will be blown into small pellets or even marble-sized balls called “grapple”. Natural snow can be very wet or dry, depending on its water content, the same as with man-made. After two or three days on the ski runs, natural snow becomes indistinguishable from man-made as both are subject to skier traffic, grooming, and the freeze/thaw cycle. Many miles of buried steel air and water pipe lines, from 2 inches to 2 feet in diameter, deliver the high pressure water and air throughout the mountain. Attached to the main lines are hydrants placed on the sides of runs, every 50 to 150 feet or so. Each resort has about 500 hydrants lining its runs. The “air” guns are attached to the hydrants by air and water hoses and the “fan” guns by water hoses and electrical lines. The guns are placed exactly where the snow is to be made and when enough snow is made at one location, they are moved to another. We use two types of snowmaking guns. One uses compressed air mixed with water at the gun (which is really just a tube with a small nozzle at the end) to atomize the water into particles small enough to freeze quickly. The other “airless” type uses an electric fan in a 5 foot long by 2 ½ foot wide tube that pushes an air stream into which small particles of water are sprayed by dozens of tiny nozzles on the rim of the tube. (Fan guns aren’t completely “airless”; there is a small on-board compressor that helps to atomize the water at the nozzles.) If we just sprayed water straight out from a hose, without atomizing the water, it would be like rain water droplets that are too big to freeze before they hit the ground, which would then freeze on the ground as ordinary ice. The colder and drier the air, the more snow can be made at each gun since more water can be introduced into the outside air mass because it can freeze faster. 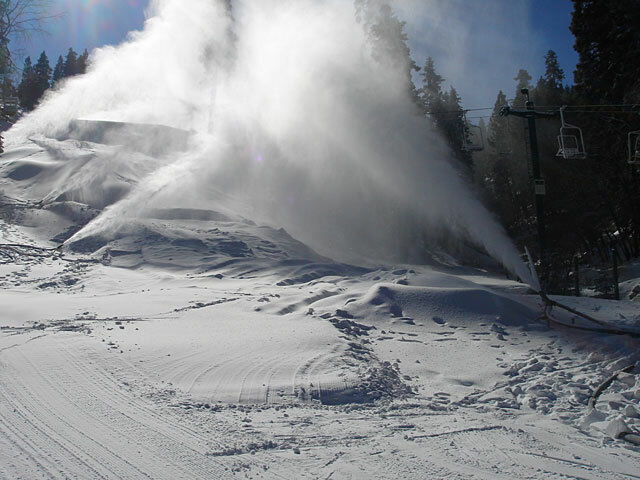 In 2006, about 70 “airless” fan guns and about 80 “air” guns can operate at one time at Snow Summit alone. Bear Mountain operates about 45 fans and 90 air guns respectively. (We actually have several types of air guns, but they all function basically the same way.) A number of both types of guns are mounted on towers, from 6 to 20 feet high. While they can’t be moved to put the snow exactly where desired, they produce more snow than guns close to the surface because there is more “hang time” for the water particles to freeze before they hit the ground. Each gun can produce an amazing amount of snow in good conditions (5% to 20% humidity and 10° to 20° F), much faster than Mother Nature. A compressed air gun can convert about 70 gallons per minute (gpm) into snow while a fan gun can convert up to 200 gpm in those conditions. (Consider that a garden hose puts out about 3 to 5 gpm.) So, in ideal conditions, each resort’s system can convert about 5,000 to 6,000 gallons of water per minute into snow! That’s a good sized stream flow that could fill a backyard pool in about 5 minutes! If a gun is left unmoved in those conditions, it can make several feet in front of it in a few hours, sometimes burying itself. We can’t put 5,000 gallons per minute worth of snow on just one run at a time due to the limitations of pipe sizes and number of hydrants, so instead, we make snow on several runs at one time and might put an average of one foot of snow down on each. In normal snowmaking conditions we can open a run in about 48 hours of snowmaking over bare ground. At the start of the season, we typically open several runs and lifts after a couple of days and nights of snowmaking, and open still more soon after that. 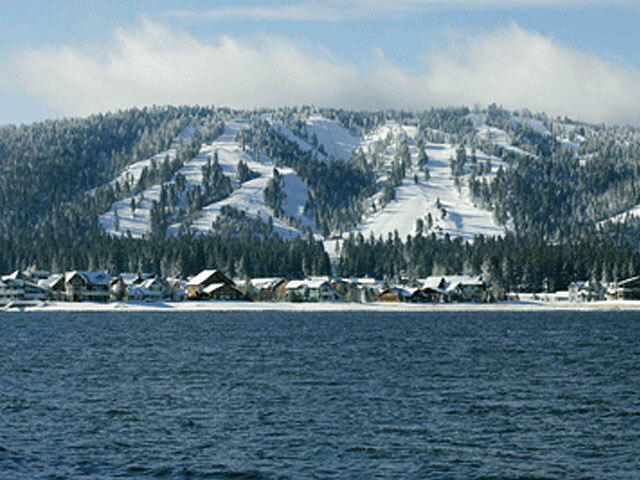 The practically unlimited water source for Big Bear Mountain Resort’s large scale snowmaking is Big Bear Lake. It’s pumped from the lake to the resorts and then up the mountains. Multi-million gallon reservoirs on the resorts store water for heavy production because the lines from the lake can’t flow enough water at those times. This lake water supply is the main reason Big Bear’s resorts can virtually guarantee skiing on most runs all winter long, even in the driest winter. Throughout the season, Summit and Bear each can produce at least twice the snow of any other local resort, which rely on limited amounts of on-site well water. We have an annual allotment from the lake that we have never needed to exceed. If used entirely, it would draw the lake level, when full, down only about 4 inches – and at least 50% of that runs back into the lake during the spring snowmelt! Grooming by snowcats pushing and tilling the man-made snow is an important element in providing good skiing. While the snowmaking guns are moved frequently, there typically will be piles left in front of each gun which must be graded into a smooth, relatively flat surface before operations. After a good period of snowmaking some of these snow mounds may be as big as a small bus and are called “whales” by the crew. After the new snow is spread evenly, the surface is gone over with a tiller on the back of the cat, which is a sort of grinder that pulverizes the top 3 to 6 inches of the snow to give it the ideal texture for skiing or boarding. Grooming is a real art to know when and how to push the snow around and condition it into a good grippy surface preferred by skiers and snowboarders. Fresh man-made snow is nearly always groomed into a consistently good surface prior to opening.